Warm Ears, Warm Hearts Foundation Inc. The Warm Ears, Warm Hearts Foundation is actively looking for volunteers interested in joining our Board of Directors! We accept adults and teenagers alike. After all, this organization was founded two years ago by someone who was 15 years old! The mission of the Warm Ears, Warm Hearts Foundation is to bring the community together to help out fellow humans through kindness and compassion. 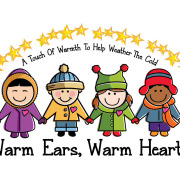 Warm Ears, Warm Hearts will do all they can to provide warmth to children in need of appropriate winter clothing. - Goal-setting, policymaking, and strategic planning. > Adds diversity to the mix of individuals comprising the Board, including age, gender, race, background, expertise, etc. More opportunities with Warm Ears, Warm Hearts Foundation Inc.
A few hours per month. It is not a very daunting job. Enthusiasm! We are looking for people to liven up the organization with bright ideas and perspectives.